Trump wants to stop Mueller. Jeff Sessions' resignation and Matthew Whitaker's promotion helps make this possible. Worried about exactly this scenario, Congress has debated a series of proposals to protect Mueller and his investigation — but none have passed. President Donald Trump’s removal of Attorney General Jeff Sessions on Wednesday afternoon, and his announcement that he was naming Sessions’ chief of staff, Matthew Whitaker, as acting attorney general, is an alarming development from the perspective of special counsel Robert Mueller’s ongoing investigation into Russian interference in the 2016 presidential election. Ultimately, although the moves have raised a series of legal questions, it’s fairly clear that the president’s appointment was at least within the power that Congress has given him. Nevertheless, these developments ought to reignite concerns over the fate and future of the Mueller probe. They should also push Congress to finally pass the bipartisan legislation protecting Mueller’s investigation that was voted out of the Senate Judiciary Committee back in April. Whitaker’s appointment does defy the traditional line of succession at the Department of Justice, however. By default, when the office of the attorney general is vacant, the deputy attorney general becomes the acting attorney general. This default rule is spelled out in the Justice Department’s succession statute, 28 U.S.C. § 508, and it’s why Deputy Attorney General Rod Rosenstein has been supervising Mueller’s investigation from the get-go (then-Attorney General Sessions had already recused himself before Mueller was even appointed.) Because there is currently no Senate-confirmed associate attorney general, the next in line after Rosenstein is the current solicitor general, Noel Francisco. 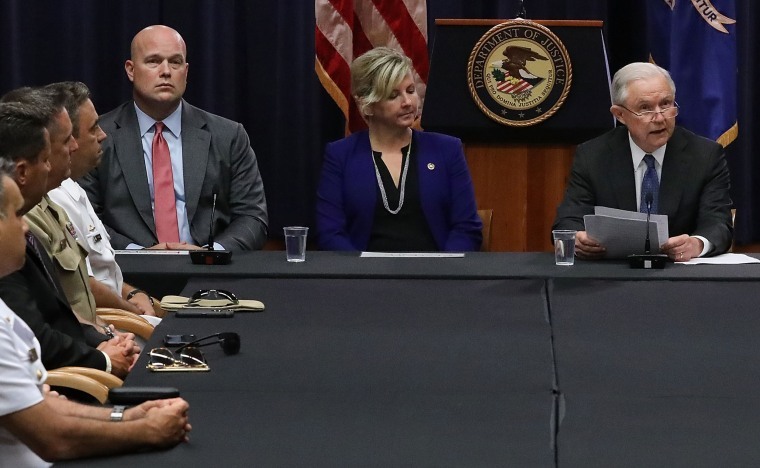 As chief of staff to the attorney general, Whitaker does not appear at any place in the Justice Department’s line of succession. Instead, Whitaker was named acting attorney general under a different statute, the Federal Vacancies Reform Act of 1998. That statute allows the president to choose from a broader pool of candidates if a holder of certain executive branch offices “dies, resigns, or is otherwise unable to perform the functions and duties of the office.” In addition to the “first assistant” to the vacant office (here, Rosenstein), the president can choose any other Senate-confirmed officer in the rest of the executive branch (think Interior Secretary Ryan Zinke) or certain non-Senate-confirmed senior officials who have served at least 90 of the last 365 days in a senior position at the same agency as the relevant office. Whitaker falls into this last category, and as the Justice Department’s Office of Legal Counsel explained in a 2007 opinion, even though Congress has also passed a DOJ-specific succession statute, the Federal Vacancies Reform Act can also apply to vacancies in senior DOJ offices. The harder legal question is whether Sessions in fact resigned. In his undated letter to the president, Sessions wrote that, “At your request, I am submitting my resignation.” Taken together with media reports that Sessions had asked if he could remain on through the end of this week and had been rebuffed, the letter’s first clause has led some to argue that Sessions was constructively fired — because he resigned only at the president’s request. This argument has some descriptive allure, but it is legally unpersuasive in the specific context of the Vacancies Reform Act. The question is not whether, as a practical matter, Sessions left of his own volition, but whether, formally, he “resign[ed].” Because Sessions could have refused to resign and forced Trump to fire him, it seems clear that, at least within the contours of the Vacancies Reform Act, he did, in fact, resign. Indeed, as much as any other officer in the federal government, the attorney general could certainly be expected to understand the legal significance of this linguistic distinction. Can Rod Rosenstein be impeached? Technically yes. But GOP's current attempt is about dirty politics, not oversight. So long as the Mueller investigation was supervised by Rosenstein, there was at least a whiff of plausibility to that argument, because there was still at least one canary in the proverbial coal mine. As of yesterday afternoon, there isn’t anymore. If passage of the bill isn’t “necessary” now, it won’t be necessary until the moment after Mueller’s investigation has been denuded, or Mueller himself has been fired. At that point, which may be coming sooner rather than later, it will be too late.